Litterbox Locations: Hide or Take Pride? 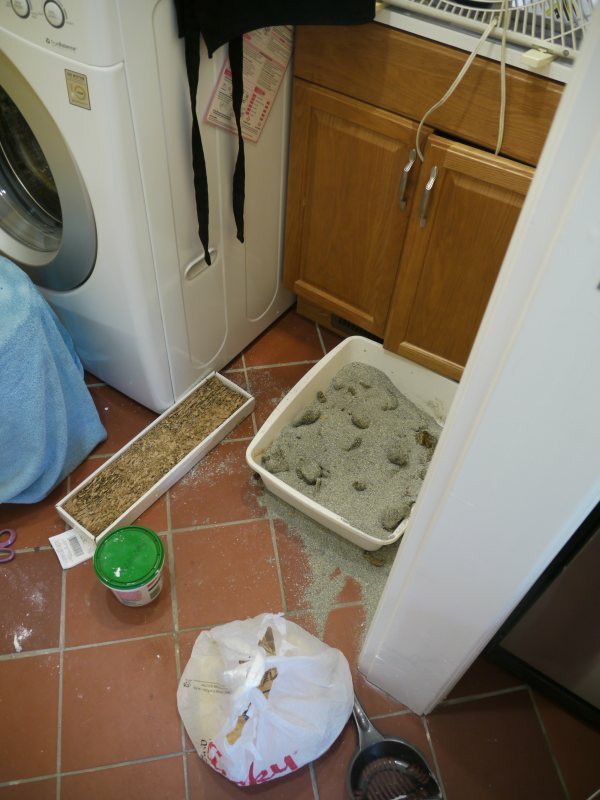 As a consultant that troubleshoots litterbox avoidance problems in your home, I often see well-intentioned cat guardians making choices for their cats that are based solely on their own preferences and not so much in the best interest of their finicky friends. It seems some folks just don’t want to live with certain cat accommodations creeping into their personal space. 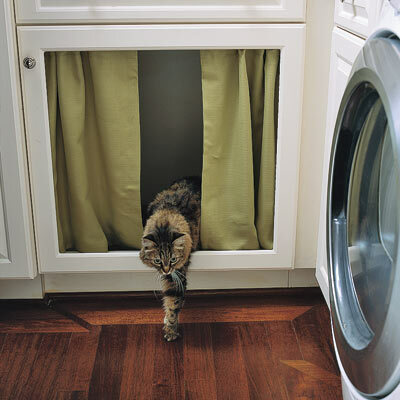 Some guardians even find out the hard way that their decision to tuck litterboxes away in backrooms, garages, under stairs, in cabinets or hidden in a designer – “camouflaged” litterbox set up, may ultimately back fire from the back end of their cat. I totally get it. It’s not your bag to see or clean litterboxes, but isn’t it ironic that the very thing you are trying to hide is now happening on your living room couch? Maybe kitty would rather be with you? It might be time to make some territorial compromises to restore the balance. Some cats just prefer to eliminate in places with more “social value”. Yup, you guessed it. I’m talking about your living room, bedroom and basically anywhere you like to hang out. Bummer… yea, I know, but we can make this work for both of you. This is going to require a trip to your “Discomfort Zone”. You know this place. It’s where you have drawn the line between your stuff and the cat’s stuff. Let’s blur that line a little, shall we? So what DO cats want when it comes to litterbox options? 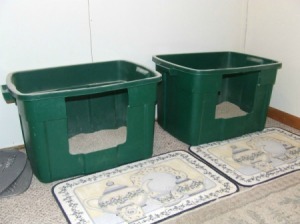 Here are some litterbox basics that will help your cat pee with glee! The boxes are ideal. Large, easy to enter and plenty of vantage points! 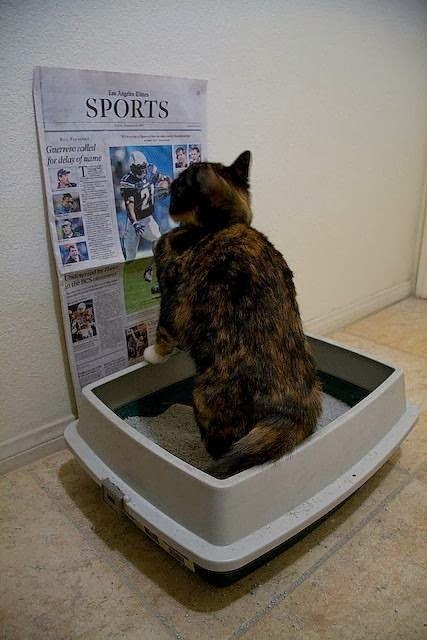 Cats need to have options when they choose territories to eliminate in. You should have one box per cat in your home, plus one extra to break the tie. Give each cat at least two places to choose from. Avoid placing boxes next to each other if you can and spread the territory out to avoid conflicts between cats competing for resources. This box is TOO SMALL! Cats prefer a box that they can enter, pivot around a few times and make a choice. 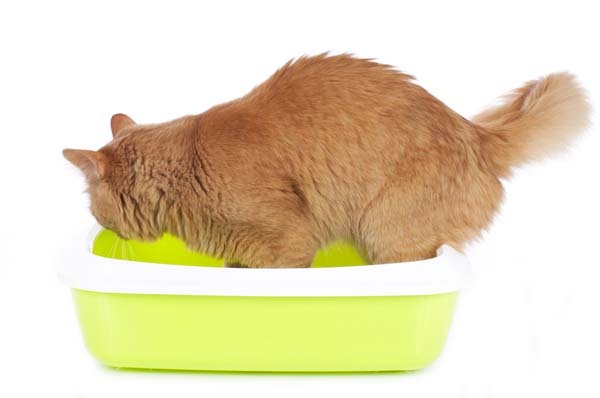 Ideally, the litterbox should be the length of your cat’s body plus ½ more space. This gives the cat ample space to move, choose a place to do their business and then depart when the dirty deeds are done. If your cat’s whole body fills the box like fresh baked bread, rising in a baking pan, it may be time to upgrade to a larger box. 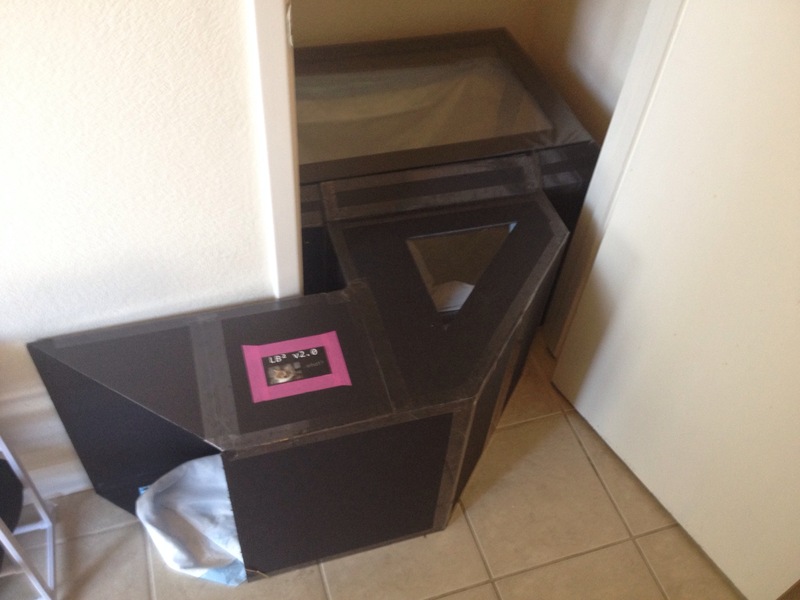 This is a litterbox constructed by one of clients, designed to eliminate tracking of litter…..Holy cow. A little overkill. 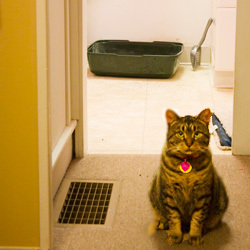 Most cats prefer an open box to eliminate in, but guardians often opt for covered boxes to manage the smell and mess associated with litterbox usage. This can limit a cat’s line of sight, restrict their headroom and movement inside the box and make entering and exiting a reason to panic or leave abruptly. Not to mention, they are hot boxed in a smelly place. Not cool. An uncovered box or large storage bin with high sides will keep the mess contained just as well. When using covered boxes, always make sure the entry/exit door faces outward (not facing a wall or barrier) and choose a box with max headroom. Avoid door flaps that have to be pushed with the cat’s head and body. Keep it simple. 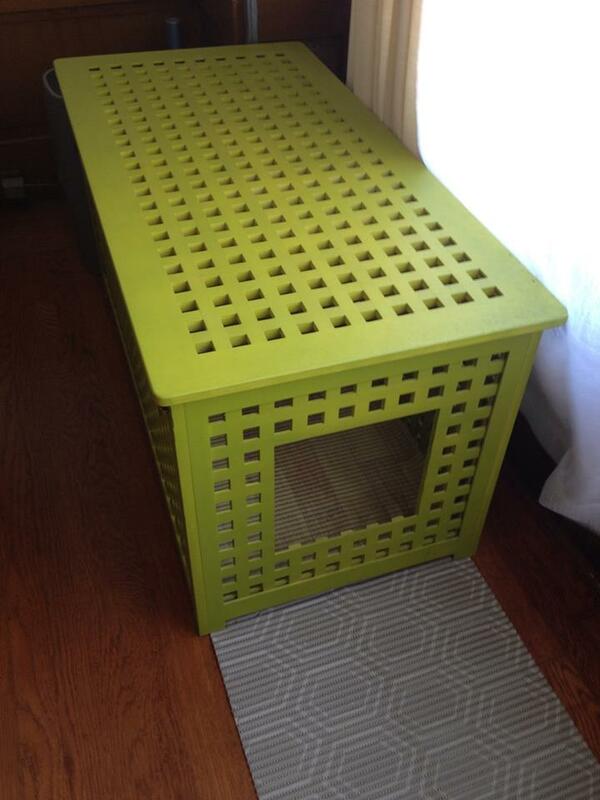 An IKEA hacked bench that works nicely as an open air litterbox cabinet. Making the right litter choice is a crucial part of keeping your cat’s dirtiest decisions inside the box. A quick clumping, flushable and super-soft litter like World’s Best Cat litter is ideal for fast and efficient removal of urine clumps, allowing the litter box to be a comfortable / viable option, all the time and every time. You will also get about 30 days of usage out of one bag! Avoid clay litter that keeps urine trapped and lingering, until you have to change the whole box. Scoop the box twice a day and adjust the litter depth to your cat’s preference. Some cats prefer less litter than others do, but keeping your depth between one and three inches is ideal for most. Out sight, out of mind. Cats are less likely to retreat back to an isolated location to eliminate. Move hidden or tucked away boxes into open spaces, common rooms and any room that you and your cats spend time together in. Select an area or areas of your home or apartment that have clear vantage points and ambush-free zones. A box that’s hidden away in a less trafficked room will also be scooped less! Do not place boxes in busy hallways, hard to reach corners or underneath tables or cabinets if they seem hesitant to enter or exit. If you opt for a stylishly camouflaged box to go with your décor, remember that the tips above still apply.